Life is indeed beautiful and at times even the smallest of gestures makes you realize that love is the centrifugal force in life. Imagine if you had to propose to your girlfriend what the cutest idea would be. Well a man in China showed how. 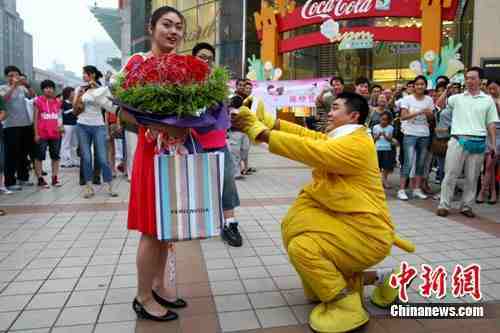 On July 12, at the New Dongan shopping mall a man dressed as 'Winnie the Pooh' proposed to his girlfriend. They had been seeing each other for 1 year. His unusual attire meant that he caught the attention of people instantly and everyone wanted to have a picture taken alongside him. His girlfriend too liked the dress-up very much and asked for a group photo. At that very instance a banner with the man proposing to the girl, a proposal ring along with 108 roses were brought to the girl. She could not believe her eyes and cried for joy at her boyfriend's unique way of showing love. She accepted 'Winnie the Pooh's' request.